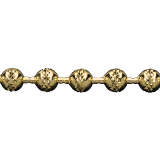 This chain was created towards the end of 2013 and was a real novelty in the jewelry world. 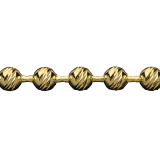 It represents the first chain that has the characteristics of a simple elastic stretch bracelet but with the strength and soundness of a metal chain. 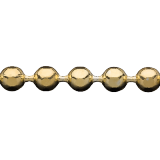 The creation of the Elastic Bead Chain meets the need of replacing the classic handmade bracelets with threaded beads. 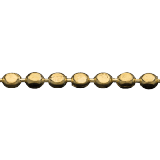 Flexibility, Strength, Convenience and Sophistication are all fundamental characteristics of FAOR Elastic Bead Chain. These are all aspects that might seem antithetical but in fact describe the chain at its best. 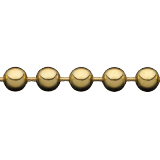 Our bead chain has an elastic silicone thread inside it. This chain is stronger than a simple elastic band threaded through. The elastic part in fact is not visible like in the handmade threaded ones and there is no possibility that one can break it. 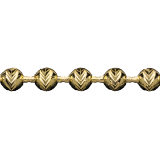 This sort of bracelet was especially aimed for younger customers looking for very colorful and fashionable accessories that were at the same time very practical and easy to wear. 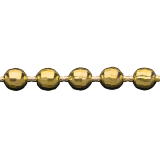 We produce Elastic Bead Chains in different gauges, from 2.5mm to 8mm, and in various metals such a Gold (14 Kt, 18 Kt) and Silver Sterling.